One day Coyote went out to visit his friend Anansi. I say friend today, because Coyote was in a friendly mood and he hoped Anansi was too. You see, sometimes they are enemies, because that is how it is when people are too much alike. You will know what I mean if you ever fall in love with the perfect girl, one who thinks like you, likes the things you like, sings the songs you sing. For a time you will be very happy, and then one day you will be very sad. Looking at your reflection all the time is dangerous, because either you fall in and drown like the beautiful boy at the stream, or you look so hard you find all the flaws that you never knew you had. Coyote was going to see Anansi today because he was bored. All of the people had gotten too easy to trick and set against each other. Everyone believed even the craziest stories he could tell. For a while that was funny, but now they had gotten better at tricking themselves than he was. This made Coyote feel bad, because they did not appreciate or fear him anymore. Even Coyote has limits on what he will do, but lately the people did not. Anansi was hard to trick. That is not to say that that he could never be tricked. It had happened before; you know the story of how Coyote got all of Anansi’s legs stuck up on a sticky gum baby. Anansi got free eventually, but Coyote had a good laugh watching him fight a doll. Coyote laughed out loud just thinking about it. When Coyote got to Anansi’s house he let himself in because the door was unlocked. This was a good idea because if Anansi was home, then they could talk, but if he was not, then Coyote could help himself to Anansi’s wife’s good cooking. Either way Coyote wins. Coyote liked to win and hated to lose. But he would rather lose then not play any game at all. He walked around Anansi’s dark house for a few minutes before he found Anansi hanging from a big web near the fire place. The room was warm and comfortable, filled with Anansi’s treasures, but Anansi looked sad. 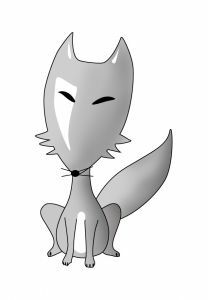 He sighed and moaned as Coyote gave his greetings. Coyote did not want to listen to his troubles, but maybe if he could figure out what was wrong with Anansi, then he could fix it quickly so they could have fun. Or maybe he could make it worse and then just Coyote could have fun. “Anansi, why do you sigh and moan? Why do you hang there, looking so sad when we could be having fun?” said Coyote. “Fun? I can’t have fun today, Coyote, I have to think. I have been tricked, and I have to find a way to get out of this mess. “ said Anansi. “Tricked! But I have not been around to see you in weeks, who could have tricked you, if not me?” Coyote asked. “I don’t even know who did it, Coyote. My wife is mad at me, and she did not make me breakfast this morning. I am sore hungry, and with my stomach empty, I can hardly think. And if I don’t figure out a way to make her happy, I will have no dinner either. But I don’t know why she is mad. She says I forgot and that I don’t love her. But I don’t even remember what I forgot. Can you help me?” he asked. Now, Coyote thought about seeing if he could stir up more trouble. Anansi’s wife was a pretty woman and a fine cook. She was normally kind and easy to live with. If Coyote could make more trouble, then maybe he could find a way to have her for himself. But he did not think that way for long. He had never seen Anansi so sad. Anansi looked almost sad enough to die, and without Anansi around, Coyote would be bored, even if he did have all the sticky honey bread he could eat. So he decided to help Anansi. He talked Anansi into coming down out of his web and looking like a man. Anansi was a handsome man, with a bald head and skin as black as a spider. His suit was as gray and soft as a spider web. All the ladies liked Anansi, because he was as good at talking as he was handsome. With Coyote’s help he should be able to talk his wife into coming home and making his dinner. So they went out into the world. First they went to the café near where Anansi lived, where all the people tell his tales. The men who sit there every day looked either as sad Anansi, or as angry as wild pigs. Coyote hurried Anansi out before he could talk to any of them. Putting him with these people would have made Anansi’s sadness worse. Or made him angry, in which case he might try to get even with his wife. If there was one person who could outsmart Anansi every time, it was his wife. So then Coyote decided to take Anansi to the big market, to see if they could find out what was going on. When they got there everything was decorated in pink, red and white. There were displays in the windows of roses, heart-shaped jewelry, and big boxes of candy. It was then that Coyote started to figure out what was going on. Coyote walked up to a girl sitting by herself looking as sad as Anansi. “Why are you so sad, girl?” asked Coyote. Oh, it was hard for Coyote to keep to the task at hand then. A boy and a girl newly broken up could have been lots of entertainment. People in that state are easy to confuse and agitate. He could have had them lost in the woods and proclaiming love to a possum before morning. Or he could have wooed her for himself. “What is special about today?” asked Coyote. “Why, you crazy man. Today is Valentine’s Day. Today is the day when my boyfriend has to give me something nice and tell me how much he loves me” said the girl. “Let me get this straight. You had a boyfriend? Were you happy?” asked Coyote. “Yeah, I guess so” said the girl. “Was he nice? He treat you ok?” Coyote asked, everything failing into place. “Well yes, except forgetting Valentine’s Day “ said the girl, near to tears. Coyote was mad, and he planned to figure out who was behind this. But right now was not the time. He had to get Anansi home and get his wife to feed him. Later they could work together to figure out who was to blame. So Anansi and Coyote got all the supplies they needed and then went back to Anansi’s house. Then Coyote went to find Anansi’s wife and bring her home, saying it was an emergency. She figured that Anansi had gotten stuck in a gourd again or some such thing. So she came hurrying home, because even though she had been tricked, she still loved him. When she got to the house the whole pathway to the door was covered with rose petals, and Anansi was hanging from above the door in spider form. When she got up to him she found that in each of his hands he held a present. There was a box of chocolate, a shiny necklace, a stuffed bear, a bottle of wine, a new hat, a jar of expensive lotion, a glass rose and a new cooking pot. The cooking pot was Coyote’s idea. Coyote knew there was nothing he could do right now to get even with whoever was behind all this. And it felt wrong somehow for everyone to be tricked without Coyote being a part of it. So he decided to go see if he could help a few break-ups happen, and maybe find a few pretty girls looking for a Perfect Man.